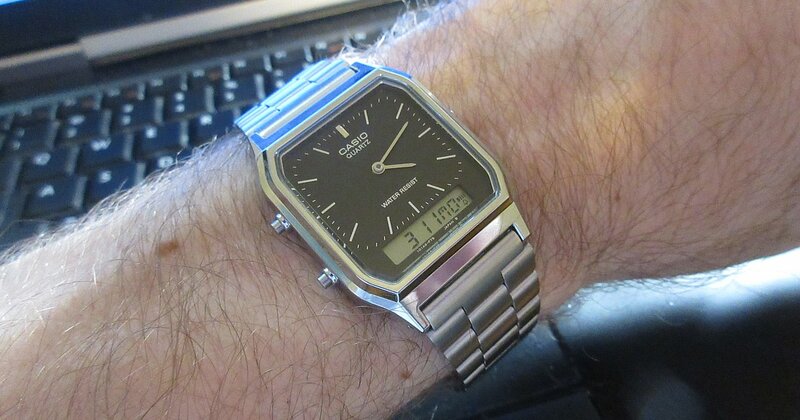 This is not my first time owning a small watch, but is the first time owning one I truly like, the Casio AQ230. Let's get a few measurements out of the way first. My wrist at the thickest point is measures about 6.75" around. However, my preference is to wear a watch at my wrist's thinnest point, which measures about 6.5", or 165mm. ...but wow, does this thing fit my wrist nicely, and does so without looking like a toy. Said up front, this watch is not easy to set. There are two buttons on left and one on the right. The right side button is shrouded on purpose so it does not get pressed accidentally, and its sole purpose is to set the analog clock. It can be used in any mode. This right button is the only way to set the hands as there is no crown. When pressed momentarily, the minute hand moves 20 seconds clockwise. When the button is held down, the hands advance at a higher speed. However, the annoying part is that if you accidentally go ahead of the time you're trying to set, you have to hold down that button and wait until the hands spin all the way around again. Why? Because the button only moves the hands clockwise and not in the reverse direction. Set the digital clock first. Hold the right side button until it's 1 minute behind the digital clock. Wait for the digital clock to reach the next minute. Once the :00 arrives, I then have 20 seconds to synchronize the analog part. I match the minute to the digital clock, and the digital and analog clocks are now synchronized. This sounds complicated, but it's not. Not to me, anyway. Press the bottom left until the time is displayed without the "DL" in the lower left corner (which is Dual Time mode and not main timekeeping). Press and hold bottom left until the seconds start flashing. Press top left to zero the seconds. Press bottom left to move to hour. Press top left to set the hour. Press bottom left to move to minutes. Press top left to set minutes. Press bottom left to move to 12/24 hour choice. Press top left to choose 12 or 24-hour time. Press bottom left to exit. The AQ230 is the only Casio watch I've ever owned that allows you to have the main timekeeping as 12-hour time and the Dual Time mode as 24-hour or vice versa. It is ordinarily the case where when you choose 12 or 24-hour, that applies to every time display on the watch. Not on the AQ230. You can have both. Pressing and holding the top left button on any mode tests the alarm tone. A very old school feature: When setting the alarm and go to set the minutes, it's set by using the first half of the minutes, then the second. This means if you were to set the alarm for 3:27, you set the hour as usual, then set the 2 by choosing 0 through 5, then the 7 by choosing 0 through 9. The stopwatch does not have a lap time feature, not that I would ever use it. The stopwatch is also operated entirely using one button. Bottom left button starts or stops the stopwatch. A long press on the bottom left resets it to zero. Dual Time is labeled as "DL" on the display and not "DT". Why? I have absolutely no idea. This watch has the ability to show 3 different times. Analog time, main timekeeping digital, and dual time digital. And yes, they can all be separate times from each other. The bottom digital panel can be switched from time to dual time, date, alarm or stopwatch. The AQ230 is very similar to now-vintage Casio models released in the early 1980s, which is part of the reason I wanted it, and it does not disappoint. Styling of this timepiece totally says "I'm from the late '70s/early '80s", especially when you get one like I did with sticks on the dial and not numbers. It's really easy to miss that the AQ230 has an octagon shape, even if the corners are very slight. The lack of a seconds hand actually makes the AQ230 look much more expensive than it is. If you know luxury timepieces at all, many of them don't have a seconds hand at all as part of that "beauty through minimalism" look. The 12-hour marker is in fact a raised shiny stick that does reflect light. The octagon corners do shimmer with light when the sun hits them. The lugs do in fact have drilled holes on the outside that makes it very easy to take off the bracelet. I like the bracelet as-is so I won't be doing that, but it's nice they're there. A timepiece like this is a godsend for small-wristed folk like myself. Easy to set? No. But really comfortable, surprisingly easy to read and looks upscale. I really dig it. Absolutely a keeper.